MeTiS was developed by Datamet to characterize inclusion population automatically from images from an optical microscope or a system consisting of a scanning electron microscope and EDS analyzer. Simple and user friendly interface assists MeTiS logical user sessions setting during measurement, methods of analysis and simulation, while allowing to obtain a large number of possibilities. meTis and metiS are hardware-independent analysis (SEM and EDS). They can be used on items deported. 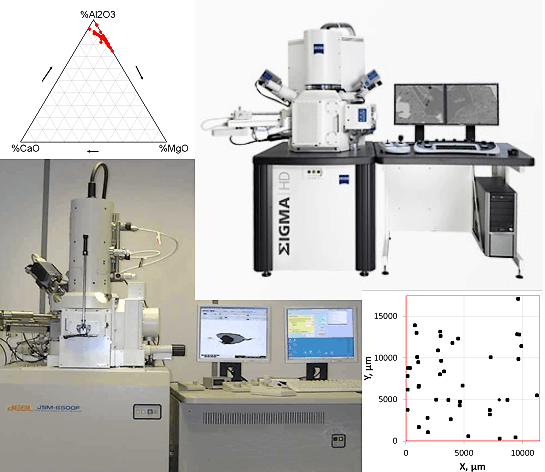 A strong coupling between the SEM, the EDS analysis system and software image analysis (Aphelion) allows an optimal characterization of inclusions with diameters ranging from a few hundred nanometers to a few tens micrometers. Work session defined by the user credentials, test, sample, etc. Object detection at low magnification, inclusion identification at higher magnification, and energy dispersive X-ray analysis. Processing software, dissociated measurement software allows multiple operations data measurement files, and return the results in Microsoft Excel. The simulation software provides access to statistical parameters of the various methods by measures calculated on virtual samples. Link to download an article about MeTiS is available at the bottom of this page.